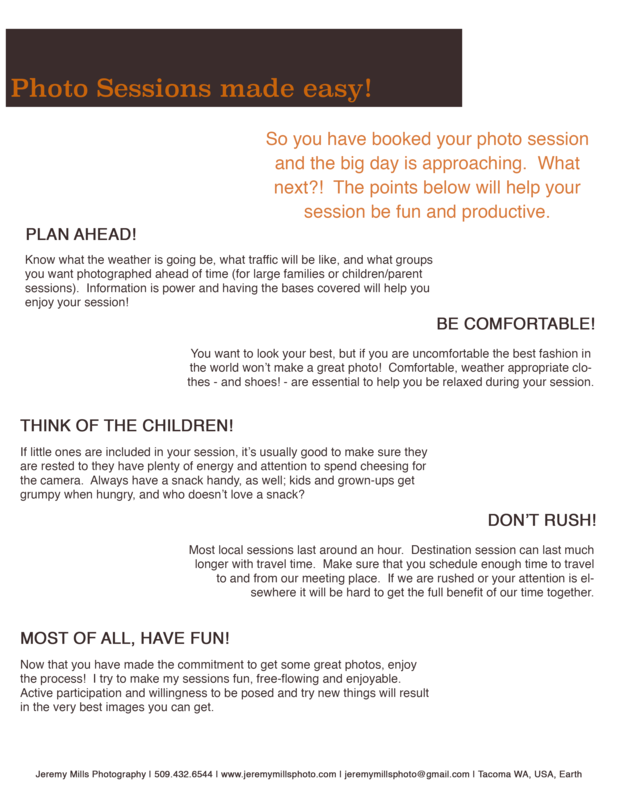 Know what the weather is going be, what traffic will be like, and what groups you want photographed ahead of time (for large families or children/parent sessions). Information is power and having the bases covered will help you enjoy your session! You want to look your best, but if you are uncomfortable the best fashion in the world won’t make a great photo! Comfortable, weather appropriate clothes - and shoes! - are essential to help you be relaxed during your session. - If little ones are included in your session, it’s usually good to make sure they are rested to they have plenty of energy and attention to spend cheesing for the camera. Always have a snack handy, as well; kids and grown-ups get grumpy when hungry, and who doesn’t love a snack? - Now that you have made the commitment to get some great photos, enjoy the process! I try to make my sessions fun, free-flowing and enjoyable. Active participation and willingness to be posed and try new things will result in the very best images you can get. • Most local sessions last around an hour. Destination session can last much longer with travel time. Make sure that you schedule enough time to travel to and from our meeting place. If we are rushed or your attention is elsewhere it will be hard to get the full benefit of our time together. Don't hesitate to task questions! Having your photo taken can be a weird experience, specially if you haven't done in it in a while! I always want people to be as comfortable as they can be, so if you have a question or want to know what I'm doing or why I'm having your children run around like airplanes, please ask! I can talk about this stuff all day.